For a fruit so minute, the blueberry sure packs a punch. Aside from being a popular summer fruit, the blueberry is also among the most nutritious fruits in the market today. In fact, you probably see them everywhere. They are canned, pureed, macerated, candied, crushed, and even juiced, making them the second most used berries in the country, second only to strawberries. Blueberries are even a popular flavor in ice creams, shakes, and other desserts, and are a much-recognized addition to baked goods like cakes, cookies, and muffins. Blueberries are so visible that it’s easy to mistake them for casual food items that are all taste and no actual health benefit. Yet for their small size, blueberries carry a heavy nutritional punch, bearing vitamins, minerals, and other substances that can do wonders for the body. Blueberries contain mostly water and a little carbohydrate. They are an excellent source of Vitamins C and K, and manganese. In a one-cup (148 grams) serving, you get 24% of the RDA for Vitamin C, 36% for Vitamin K, and 25% of the RDA for manganese. All these for just 84 calories. They contain plenty of antioxidants. Blueberries are called the “King of Antioxidant Foods” because of the large concentration of these substances in every berry. In fact, it has the highest antioxidant rate among the fruits consumed today. They help prevent cardiovascular disease. Blueberries have been proven to help reduce the oxidation of the cholesterol in the human blood, a common precursor to heart disease. These berries also contain nutrients that lower blood pressure, another cause of heart disease, as well as stroke. They help fight DNA damage. The antioxidants in blueberries aid in preventing DNA and cell damage because of free radicals. Due to this, blueberries help defend the body from diseases like cancer, as well as natural degenerative processes like aging. They help improve memory. The antioxidants found in blueberries have been observed to converge in the brain area related to intelligence. The antioxidants help repair aged and damaged cells, helping boost brain processes like thought and memory. Given in regular doses, they can help delay cognitive aging by at least 2.5 years. They help control diabetes. Blueberries contain about 15 mg of sugar per cup, making them about as sweet as other fruits. Despite this, they have anti-diabetic effects as the anthocyanin they contain help improve insulin sensitivity and glucose metabolism. They help reduce damage to muscles. This benefit of blueberries is perfect for those who love to engage in exercise and other strenuous activities. It has been shown that consuming blueberries after exercise hastened muscle repair and recovery among women. They help in good digestion. They contain dietary fiber, which makes them great at preventing constipation and promoting general digestive health. Blueberries belie their considerable nutritional content with their size. Considering how they contain a wide range of nutrients and antioxidants, there should be little doubt on whether or not they should be incorporated into one’s diet. 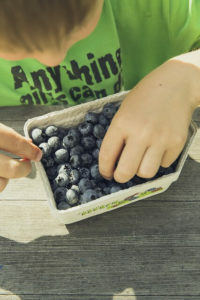 It should be noted, however, that blueberries are most often used in sweet food items that contain ingredients that may offset the berries’ nutritional benefits.